The Euro is still an experiment. Like any experiment it needs to withstand the results of testing under stress conditions. The present stresses within the PIGS have pushed the Euro and the viability of the EMU onto the global stage with all the attention of “The Emperor has no Clothes”! Whether the Euro is your domestic currency; or you peg your currency to the Euro; or you are significantly influenced economically by the Euro, you are now infected by the possibility of contagion. The experiment was launched and founded on ‘half measures’. If everything worked over time there was the possibility of political unification. If things failed there was the return to independent monetary policy. Everyone agreed that time would tell. When sovereign countries are placed under economic pressures, due to governments’ historically inevitable inability to reign in fiscal spending and election entitlement promise, Can they then implement unpopular policy reforms without resorting to currency debasement and the governments’ stealth tax of inflation? 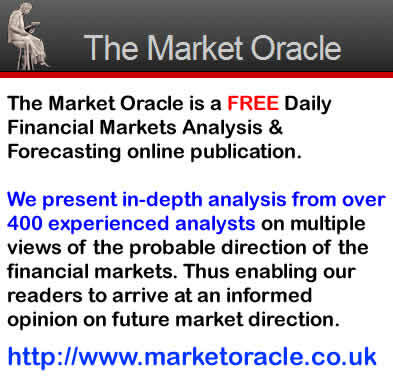 The whole basis of the EMU and Euro currency rests on the outcome of the highly visible public tests underway. Users of the Euro surrendered their option of sovereign monetary policy with their EMU membership which has been historically the escape route for trapped political regimes. The global financial media and markets are presently riveted on the PIGS! Though there appears every reason for this, due to the dramatic rise in CDS prices, the real looming problem is much more frightening. We have felt strongly since the US Sub-Prime problems unfolded, leading the world to nearly the financial abyss, that Central & Eastern Europe was actually the ultimate “sub-prime” problem. From Hungary to the Baltic States of Estonia, Lithuania and Latvia, financial problems are prevalent and tied in some way to the hell that is the Euro. 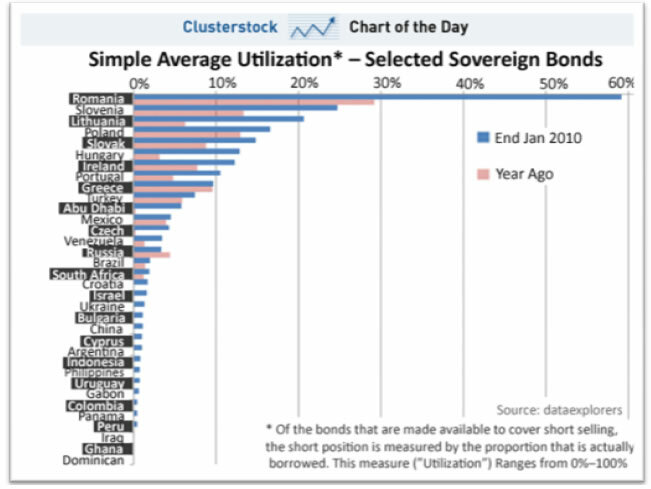 The chart from a February report by Dataexplorers (3) showing bond shorting activity confirms the bigger problem is being viewed by investors to be in fact in Central & Eastern Europe. Romania, Slovenia, Lithuania, Poland, Slovak and Hungary are all above Portugal & Greece in investor decisions to actually take action and put their money on the line by shorting these countries’ sovereign debt. Global investors continue to see headline stories from the WSJ 01-28-10: Latvian Annual CPI Falls Further Amid Deep Recession, and ABC News 02-08-10: Lithuanian Economy Shrinks 15 Pct in 2009 that are worrisome. What may yet not be fully appreciated is that these problems are becoming even more serious due to potential European banking stability concerns, every day the PIGS problem is allowed to fester by ECB dithering. But is it dithering that is really occurring or the fatal flaw of the whole Euro experiment? Is the Euro not fundamentally based on an assumption that democratically elected governments (even those with left leaning policies) and huge legacy entitlements can actually ‘Walk-the-Talk’ and implement tough choices when they are required by EMU charter requirements? We mean specifically the tough choices spelled with a capital “T”; like those testing Greece’s newly mandated socialist party or Portugal’s also recently elected government with a 10 percent Maoist-Trotskyist Bloco vote. Under close examination, the one striking similarity of all the countries with heavy bond shorting is that they also all have an electorate that has a history of socialist legacy expectations. This is not a political statement but rather an observation of the likely resistance to the implementation of tougher austerity measures that are certainly ahead. When the electorate is facing historical unemployment, how exactly do you stimulate the economy while making massive fiscal adjustments to fiscal budgets to meet EMU debt level governance? This is historically when a country resorts to loosening monetary policies, ‘money printing’ or other forms of currency depreciation. 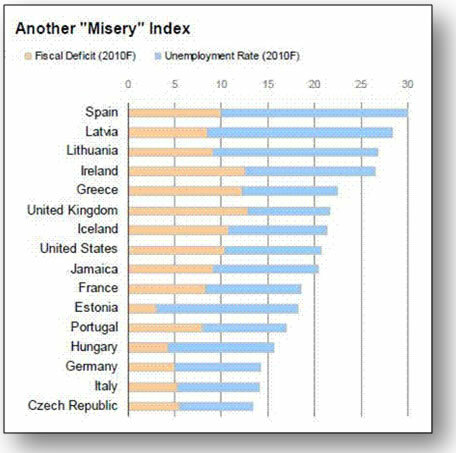 The Misery Index chart shows a significant correlation between the countries being shorted and those also with: failing fiscal policies, fiscal deficits, high unemployment and a disgruntled electorate! 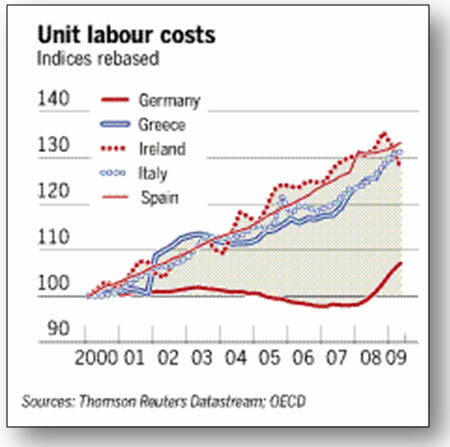 Serious social unrest is the obvious consequence that will eventually be blamed on the EMU and the Euro. Is it realistic to expect Greece to fulfill its promise to reduce its fiscal deficit from approximately 12.7 per cent of gross domestic product to 3 per cent by 2012? This has less likelihood of happening then a successful accounting audit of the Greek government financial books! “The euro zone’s manufacturing sector is growing at its fastest pace in two years. However, there are dramatic differences in how manufacturing is faring within the eurozone which point to the currency as a major source for the loss of competitiveness in Greece, Spain and Ireland. The eurozone manufacturing purchasing manager’s index came in at 52.4 for January, which is the fourth monthly rise and indicates that the manufacturing sector is expanding in the eurozone as a whole. But expansion is not a uniform condition. At Europe’s old 1957 core, things are looking bright. What the press is following with such interest are the symptoms - symptoms of a possible failed experiment based on an unproven assumption. Whatever the outcome or actions taken to remedy the problems, we can be fairly confident it will not be part of the original EMU governing body of laws and regulations. The chances are good that the present standoff between the ECB and PIGS will end with either 1) the ECB creating a massive new moral hazard situation, 2) an IMF bailout, 3) an EC member countries defaulting or 4) the splintering of the union itself. None of the alternatives are particularly appealing and have consequences. “Most of the time having an independent currency is nothing but a nuisance. But every so often and quite unpredictably, countries desperately need a safety valve. The 1930s were a time when such relief was needed. Our own era is posing what look like similar challenges. Stuff does, indeed, happen. Having willed the creation of the euro, its members must overcome the difficulties that arise when, as now, stuff happens”. What may be an even bigger concern for the global economy overall, is that the consequences of these resolution activities will likely slow the unwinding of the EU financial actions implemented to stem the financial crisis. This will stealthily seal the case for very high levels of inflation to quietly appear on the horizon as we are all distracted.